May is Scrapbooking Month, so in addition to highlighting some of our awesome scrapbooking courses, we’re also diving into the art of scrapbooking, and offering helpful tips. But in an increasingly paperless world, many photographers (and regular families, for that matter) have made the switch from film to Photoshop. So if you find that you don’t have a lot of analog photos lying around, but you still want to save your memories in an attractive, fun way, digital scrapbooking might just be the thing for you. National Association of Digital Scrapbookers found Michelle Stelling has taught courses in digital scrapbooking that range from ultra-basic to super-advanced, and has helped thousands of scrapbookers make the move from gluesticks and glitter pens to masking tools and multi-layer masterpieces. You can edit the photos: One of the biggest challenges with regular scrapbooking is that you’re printing out digital photos that you’re edited, you’re sort of stuck with whatever photos you have, even if they have distracting elements or other unappealing features. Digital scrapbooking, however, gives you the ability to edit photos to suit your needs, whether it be casting new colors, swapping to black-and-white, or cloning out elements. The mess is minimal: If you live in a very tight space, you may not have a lot of room to spread out your various paper, photos, and other tools. And if you’re working on a laptop, you can scrapbook anywhere — the airport, a hotel, even the porch on a sunny day. You can use photos from anywhere: Instagram? Facebook? 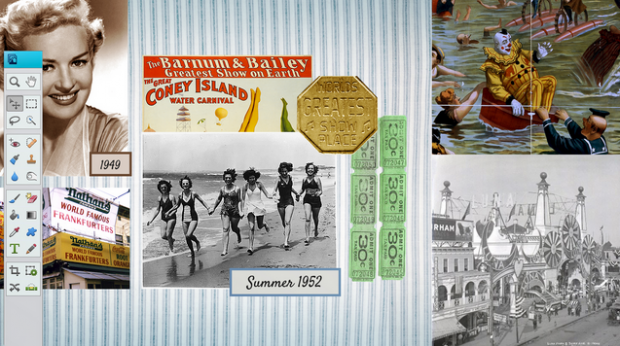 Put your social media pictures to work in your digital scrapbooks. The same goes for all your iPhone photos that are just taking up space on your SD card. You can try it for FREE: Starting this Friday, we’ll be rebroadcasting Michelle’s Digital Scrapbooking for Beginners for free on CreativeLive, giving you the perfect opportunity to try out this cool new way to save your photos. Even if you’ve never opened Photoshop before, this is your chance to give it a whirl. You don’t have to give up analog scrapbooking: This isn’t an either/or situation — if you really love scrapbooking, consider going digital just one more way to enjoy your favorite pursuit in a slightly different facet.